The fundamental aspect of the Rebbe Maharash’s service is expressed in his adage Lechat’chilah aribber, “Right from the outset, you should climb over.” This is the message that should permeate our conduct throughout the entire day, beginning with our service of Torah and mitzvos, which is the essence of our being for “I was only created to serve my Creator,” and extending into every aspect of our conduct. All our efforts must be characterized by the approach of Lechat’chilah aribber. Each person has the potential to carry out such service, and is aided in these efforts by G‑d Himself. G‑d’s help does not detract from the virtue of a person carrying out the service on his own initiative. Although G‑d offers assistance in every aspect of our service, it is man who carries the responsibility for this service from its beginning until its end. The approach of Lechat’chilah aribber is particularly relevant this year, a year in which “I will show you wonders” and in particular, in the present days when since the 27th of Nissan, we have experienced two sets of three day periods of holiness and happiness. This will be brought about by the completion of our service. If anywhere there is a good deed, a good thought, or a good word that has to be completed, it will be completed and — in the spirit of the seven “perfect”2 weeks of the Counting of the Omer — completed in a perfect manner. Indeed, this perfection will be revealed before the completion of the Counting of the Omer as reflected in the prayer recited after counting each night, “May the Merciful One return to us the service of the Beis HaMikdash speedily….” The intent is that the redemption should come directly after our reciting this prayer. This will be enhanced by the firm resolutions made by the Jewish people. Their strength and their firmness will be revealed, not only by their continuity over an extended period, but in a manner of Lechat’chilah aribber, i.e., at the very outset, their strength will be seen.3 Furthermore, that strength will be reflected even in the mundane dimensions of our conduct. To focus on the Rebbe Maharash’s statement at greater length: The Rebbe would say, “Generally, people say, ‘If you can’t crawl under, try to climb over,’ and I say, Lechat’chilah aribber, ‘Right from the outset, you should climb over.’ ” On the surface, it was unnecessary for the Rebbe to mention what others think. By doing so, however, he emphasizes that a Jew is aware of the approach which is generally accepted. Nevertheless, as a Jew, he has a potential to reveal a new approach, Lechat’chilah aribber, and have that approach permeate even the most mundane aspects of our existence. May this enable us to merit the redemption immediately. In the prayer recited after Counting the Omer, we state how this counting corrects our souls (on all the three levels of nefesh, ruach, and neshamah). Similarly, it spreads “correction” in the world at large, elevating every dimension of existence. In this manner, the world at large and the Jewish people become ready to receive the revelations that will accompany the future redemption. This is enhanced by the influence of the last months: Adar, a month associated with health and strength and Nissan, a month of miracles of a truly wondrous nature. Similarly, this is amplified by the influence of the present month, Iyar, whose name (אייר) serves as an acronym for the names Avraham, Yitzchak, Yaakov, and Rachel who represent the four “legs” of the Heavenly Chariot. The above will also be enhanced by the Torah portion which is associated with the present days, Parshas Tazria. This Torah portion which begins, “When a woman conceives and gives birth,” refers to the Jewish people who — in their relationship with G‑d — are described as a woman. They will soon give birth, a metaphor for the coming redemption. The Talmud also associates the above with Jewish children whom it describes with the verse “Do not touch My anointed (Mishichoi).” This points to a connection between Jewish children and Mashiach. As explained on several occasions, what occurs to one particular generation effects the totality of the history of our nation. It affects the previous generations, because this is their continuity, and it affects the coming generations because it sets the tone for their service. Based on the concept that a father transfers the essence of his being to his children, we can assume that it is not merely the superficial aspects, but rather the essence of each generation which is conveyed. This concept also relates to the teaching of the Baal Shem Tov that G‑d cherishes every Jew like an only child born to a father in his old age. This perfection results from the fact that the weeks of the Counting of the Omerbegin Saturday night and conclude on Shabbos. We see a parallel to this concept in the Rebbe Maharash’s position within the Chabad Nesi’im. He was the fourth of the Rebbeim. Thus the first threeRebbeim can be considered as bringing about a chazakah, a threefold sequence associated with strength and permanence, and the Rebbe Maharash and the two Rebbeim who followed him, can be considered as bringing about a second chazakah. The Rebbe Maharash begins that secondchazakah with a strong stance at its very outset, in a manner ofLechat’chilah aribber. 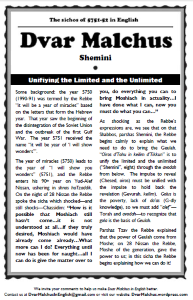 28 Nissan: Do All You Can to Bring Moshiach Into Reality! 1. The nature of the month of Nissan is reflected by the holiday of Pesach, “the season of our freedom.” This year this dimension is given additional emphasis because the Pesach holiday began on Shabbos. In regard to the days of the week, Shabbos is a day of freedom, a day when we are “freed” from work and other mundane activities and all of our needs have been prepared for previously. This allows each Jew to feel that he is free and, furthermore, that he controls his environment. The freedom of Pesach resembles the freedom that will be experienced in the Era of Redemption. All redemptions share a common factor. In particular, the redemption from Egypt which is commemorated on Pesach was the first redemption and thus, includes within it the source for all subsequent redemptions, including the ultimate redemption. Indeed, the redemption from Egypt was intended to lead directly to that ultimate redemption. This is reflected in the Jews’ declaration in the song of the Red Sea, “G‑d will reign forever and ever.” This declaration reflected the state of the Jewish people at that time and would have been expressed within the world at large, allowing for a redemption that would never be followed by exile had not several undesirable events occurred. It took only one journey to leave Egypt. Why does the verse mention “journeys”? To intimate that all the journeys of the Jewish people, the entire progress of our people throughout the generations until they reach, “the Sanctuary of G‑d established by Your hands,” the Third Beis HaMikdash, was included in the first journey out of Egypt. There is, however, a difference between the splitting of the sea and the exodus. Our Sages explain that even though the Jews left Egypt, they still feared the Egyptians within their hearts. It was not until the Egyptians were totally annihilated at the Red Sea did this fear depart from them. In contrast, when the Jews left Egypt, the Egyptians were still in a position of power. Indeed, it was they who drove the Jews out of Egypt. This is reflected in the miracle associated with Shabbos HaGadol, “the smiting of Egypt with their firstborn.” This implies that although the Egyptians were “smitten” by their own sons because they refused to free the Jews, nevertheless, they remained powerful. The miraculous nature of this process is that it was their own firstborn — the power of the Egyptians — who smote them so that they would release the Jews. At present, in this, the year when “I will show you wonders,” beginning from the days of Purim, we have seen a reenactment of the miracle of “To strike Egypt with their firstborn.” Mitzrayim, Egypt in Hebrew, is related to the wordmeitzorim which means “cause suffering,” and thus refers to “those who cause suffering to the Jews.” The firstborn of Egypt, i.e., the most powerful forces among the gentiles, struck out against the power who desired to cause suffering to the Jews, humiliating him and forcing him to carry out all the directives which they dictated to him, beginning from his acknowledgement of regret for his previous conduct. Purim was just the beginning of his downfall; his descent has continued from day to day, until at present, in the last days of Nissan, the firstborn of the gentiles (i.e., the United Nations) has given him a detailed list of instructions including: a) the return of all captives, and that this be supervised by the U.N. to ensure that this commitment is indeed kept, and b) payment for all the damages that he caused according to a fixed timetable. Furthermore, they are compelling him to reveal and to destroy all the weaponry which he has concealed until the present. Therefore, when a Jew asks when can we actually see miracles, revealed wonders like those which accompanied the redemptions of Pesach and Purim, we should tell him to look at what is happening before his eyes. Indeed, the miracles we are seeing surpass those of Purim. The miracles of Purim were enclothed within the natural order, and in order to allow us to appreciate them, it is necessary for the Megillah to relate the entire chronology of Achashverosh’s reign.1 In contrast, the miracles of the present year are openly revealed and we see how the enemy of the Jewish people has been routed and humiliated, and furthermore, how that humiliation has continued and increased until the present day. Everyone knows about all these matters because they have been published in the newspapers. For some reason, everyone feels that it’s important that he knows everything which is printed in the newspapers, and indeed, that he know all the details and be able to venture an opinion about what the generals and the ministers say. In truth, a Jew’s direct effect on these matters is very limited. The primary manner in which he can have an effect is to recite a chapter of Tehillim or to increase his study of the Torah and his performance of its mitzvos, and to do the latter b’hiddur, in a beautiful and conscientious manner. And most important, to study Pnimiyus HaTorah which prepares the world for Mashiach’scoming. This is where a Jew should devote his energies. Nevertheless, everyone wastes a certain amount of time clarifying these current events, finding out what so and so says, and trying to prove that so and so made a mistake and the like. This is the opposite of the conduct of “a wise and understanding nation.” Indeed, even gentiles can appreciate its fruitlessness. The above is enhanced by the fact that this year, we read Parshas Shemini,eight times. It is said Shemini Shemoneh Shemainoh, “When Parshas Sheminiis read eight times (i.e., this includes the readings on the Shabbos afternoons and on Mondays and Thursdays), it will be a plentiful year.” The year will also be plentiful with miracles and wonders, including the wonders which everyone saw in the past, sees in the present, and will see more of in the future. As we see in the last days, there was another U.N. resolution against Saddam. Surely, we will see more wonders of this nature in the future, and in the very near future. May G‑d grant every Jew “eyes to see, ears to hear, and a knowing heart,” to appreciate these wonders. Surely, these potentials have been granted for it is already past the fortieth year. It is written, “For forty years, I quarreled with a generation;” i.e., for forty years, G‑d kept the Jews in the desert. Ultimately, however, the psalm concludes with the mention of “My resting place.” In the fullest sense, this is a reference to the Era of Redemption when we will experience true rest and rest from this, the final exile. In addition to each person’s appreciation of these miracles, he has an obligation to make them known to a friend and to influence his friends to realize that he is seeing open miracles. His friend may have convinced himself that nothing special is happening, that everything is carrying on in an ordinary manner. It is necessary to explain to such a person that these are open miracles and that they are an expression of the miraculous nature of Nissan as our Sages said, “When a person sees a word with two nunnim in a dream, miracles of a truly wondrous nature will occur to him.” If this is true when such a word appears in a dream, surely it is true in regard to the month of Nissan. This is also the answer which a father or a mother must give a child when the child asks at the Seder “Why do we recline?” and the child continues asking: It says in the Haggadah, “The Holy One, blessed be He, did not redeem only our ancestors from Egypt, but rather, He redeemed us with them;” “Had the Holy One, blessed be He, not redeemed our ancestors from Egypt, we, our children and our children’s children would be slaves to Pharaoh in Egypt.” The child complains: We have not seen miracles like our ancestors did? We must answer him that we have seen such miracles: We have seen how G‑d “smote Egypt with their firstborn,” one of the miracles which accompanied the exodus from Egypt. May the redemption come immediately so that we will not have to spend any further time explaining about the miracles G‑d works for us. There is a greater potential for this in the present year when the first day of Pesach and thus the last day of Pesach fall on Shabbos, “the days of your rejoicing.” The last day of Pesach is when it is customary to hold the Feast of Mashiach, when the concept of Mashiach is internalized to the point where it becomes part of our flesh and blood. Thus, the distribution of kos shel berachah was on Saturday night, a time associated with partaking of the Melaveh Malkah, the meal associated with King David, the anointed king. May we proceed from the last days of Pesach to the ultimate redemption. There is a connection between the two for the first days of Pesach are associated with the redemption from Egypt and the last days, and in particular, the eighth day, are associated with the ultimate redemption. There is another dimension to the miraculous sequence of events which is taking place at present that resembles the exodus from Egypt. The Midrash relates that when the Jews “spoiled” the Egyptians, they took even the gold and the silver which was hidden away. When the Jews asked them for gifts, the Egyptians forced them to take all their treasured property. Similarly, today, after the enemy of the Jews was routed, he was forced to reveal all his hidden treasures and give them to other nations, including generous nations who will employ these resources for positive purposes. Among these purposes are the settlement of those Jews who have in a very real way experienced an exodus from Egypt, i.e., the Jews who are leaving Russia and coming to settle in Eretz Yisrael. These funds are being used to meet the needs of these immigrants, and indeed to allow them to settle in prosperity, in a manner in which they will acquire both material and spiritual wealth. We will merit this by reaching complete fear — to the fullest extent possible — at present in exile. Similarly, this will be enhanced by the efforts of the entire Jewish people helping these Russian Jews settle in Eretz Yisrael. Among those offering this assistance are Jews who previously did not have — in an open and revealed way — a connection to the Torah and its mitzvos. They will begin to develop such a connection by helping other people in their observance and, then step by step, they and their families will also begin studying the Torah and observing its mitzvos, and doing so with happiness and joy. There is a greater emphasis on this in the month of Nissan, a month when the entire Jewish people are described as Tzaddikim, “righteous.” This is reflected in the practice where Tachanun (which includes the confessional prayers) is omitted throughout the month of Nissan. In Nissan, a Jew is above the need for repentance for sin. He too will turn to G‑d in teshuvah, but with teshuvah which has no connection with sin, but rather resembles the ultimate state of teshuvah to which Mashiach will motivate the righteous in the Era of Redemption. May we merit to have all the above revealed openly. And this will start with our appreciation of the miracles which have happened already — an appreciation so great that we will not be embarrassed to dance in celebration for we are witnessing open miracles each day. When we make an effort to explain this to others, we will see that this explanation will be readily accepted. The same translation as posted previously is also available here in PDF format. Periodically parshas Shemini (“Eighth”, referring to the 8th day of setting up the Mishkan in the desert) is read 8 times (this occurs outside of Eretz Yisroel in a year when the Yom Tov of Pesach falls out on Shabbos). This gives rise to the expression “Shemini Shmoneh Shmeina”, meaning “[When parshat] Shemini (“Eighth”) [is read] Shmoneh [eight times, then the year is] Shmeina [fat]”—with material and spiritual abundance. All the more so in the year this sicha was originally said, when it coincided with beginning to learn Pirkei Avos, and also Sefiras Ha’Omer started and ended on Shabbos. This special quality is not only present in a year when this occurs, but is drawn into all the years until the next time that it comes to be read 8 times. The “eighth” that is mentioned in this parsha is the beginning of the indwelling of the Shechina in the Mishkan. What is the significance of 8? The world derives from 7—this is the number of days of Creation, days of the week, the 7 midos (emotional attributes as described in Chassidus). The number 7 represents G-dly light as it is enclothed in the Creation, the “Seder Hishtalshelus”. The number 8 represents the G-dly light above Hishtalshelus, and it is specifically on the 8th day that we find the Shechina (revelation of G-dliness Above the Creation) being revealed in the Mishkan. Hashem’s intent in creating the world is that the G-dly light that is above Hishtalshelus (represented by Shemini, 8th) will not remain separate but rather will be drawn down to be revealed in the world in a way that the world, on its own terms, will be able to receive this revelation. This is a unification of 2 things: 1) Revelation above limitation and 2) Limitation. These two aspects when unified allow for the recipient to be a vessel to accept this revelation in an internalized way. The order of this avodah is from below to above. This is connected with the revelation of the Shechina in “the work of your hands”, the Mishkan. This is exemplified in the words of the Sages that the place of the Aron Kodesh (containing the Luchos) transcended limitation (“eino min hamida”). The Aron itself had precise measurements, but the place transcended limitation, meaning limitation and unlimited together, that the unlimited can be grasped by within the bounds of the lower (limited) entity.